Winkston Farmhouse Bed and Breakfast accommodation is a comfortable Georgian Country House situated on our working farm, set in very pleasant gardens, overlooking the beautiful Scottish Borders countryside with views towards Peebles. We are a long established family business and you can always be assured of a very warm welcome whether your stay is for one night, or longer. Many of our guests are regular visitors to Winkston Farmhouse Bed & Breakfast or our self catering cottages. Our aim is to offer quality and friendly customer care during your stay with us. Our guest rooms are 4 star Gold graded multi-purpose rooms, The Orchard View & Hamilton View – double, twin or family – with zip and links beds to suit your personal requirements. 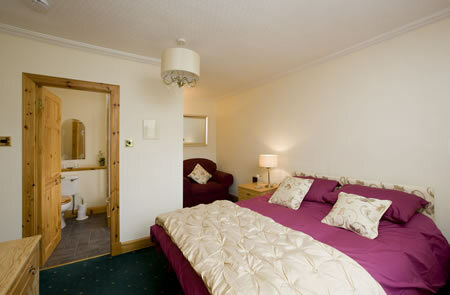 All rooms have luxury en-suite shower rooms. Centrally located for Peebles, Edinburgh & the Scottish Borders. We are situated near the main Edinburgh/ Scottish Borders bus route. Great restaurants, shops , leusure facilities near by including a swimming pool, golf course & of course the world famous Glentress & Innerleithen mountain bike areas. So much here to suit all the family. Take a look around our luxury holiday accommodation with our new interactive virtual tour. Click on the image to open a new window and explore! We offer an extensive breakfast menu including full Scottish or smoked salmon and scrambled eggs, cheese and fruit platter and much more. (Dietary requirements catered for on request) See our Breakfast Menu for more details. Tranquility, but just 5 minutes drive into Peebles, a bustling Borders town. Open all year excluding Christmas and New Year.